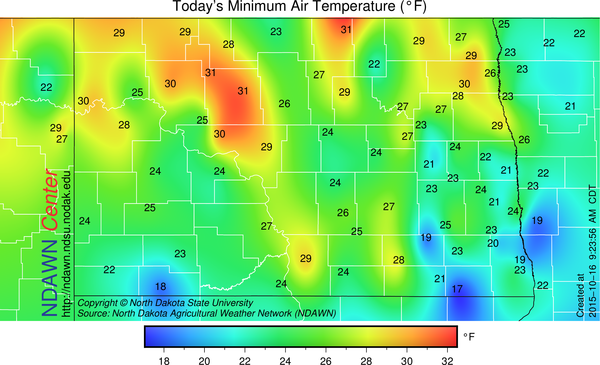 The minimums this morning ranged from the upper 10s to the lower 30s with the average being in the mid 20s. Low temperatures will probably be warmer on Saturday morning, but still 32° or lower potential in many locations. Mostly dry and mild weather conditions are continued to be expected in the next 6 to 10 days. Maximums will raise into the 60s on Sunday and Monday before another cold front moves through lowering maximums into the 50s much of next week, but that even those days the temperatures would be slightly above seasonal averages. Early indications are temperatures may reach the 60s again for the following weekend. Some of the temperature transitions will be associated with some rain, but amounts look light, so although, perhaps not perfectly dry, rain amounts look to not be impacting the continued harvest much in the next 6-10 days.